This is plate 21 from 'Sketches in Afghaunistan' by James Atkinson. During the first Anglo-Afghan war (1839-42) a combined force of British and Indian troops made an arduous trek to Kabul to install the pro-British Shah Shuja as Emir of Afghanistan. They captured Kabul and deposed Dost Mohammad. This was achieved at terrible cost, however, and ultimately the British had to retreat, suffering huge losses as the Afghans regrouped and laid siege. 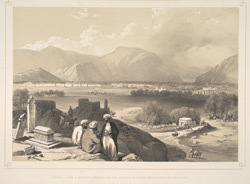 Atkinson wrote that the burial ground north-east of Kabul was, "remarkable for its neatness, numerous interments and tombs", but, "Cabul has no pretensions to beauty, being huddled together and bounded on three sides by immense mountains occupying a space of about three miles in circumference with a strongly fortified wall running on the ridges". He found the burial ground and Kabul "too painful a subject to contemplate". A Britisg doctor called Bryden was the lone survivor of a 16,000-strong force massacred in its retreat from Kabul.